Now this might end up being one of the freshest tours of the summer. 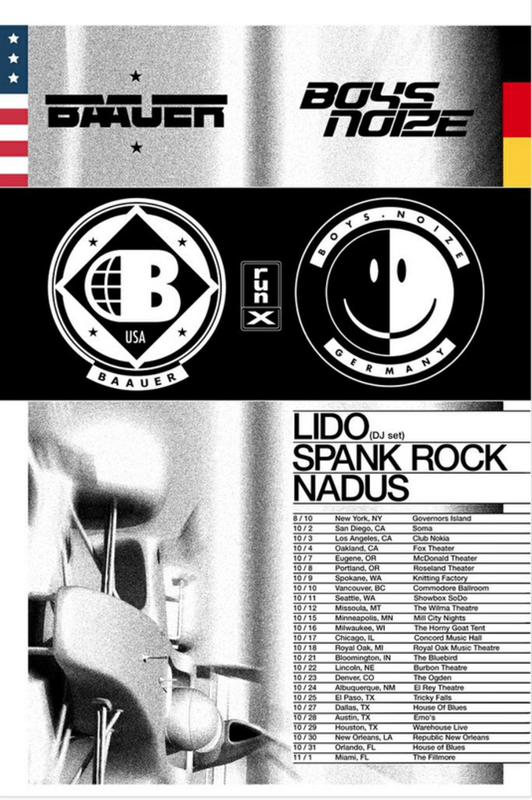 It hit the wire today that Baauer and Boys Noize are embarking on a "run X" tour, which will be hitting numerous spots in North American for the month of October, with a few dates in August and November as well. They aren&apos;t traveling alone, though: along for the ride are Lido, Nadus, and Spank Rock. This is NOT one to miss. Check out the full list of dates down below, and don&apos;t delay; tickets go on sale this Friday. EDIT The official press release on this tour revealed a few things. First off, the track you hear in the promo clip is a collaboration between Baauer and Boys Noize entitled "Fire Like This." Secondly, and most importantly, the August 10 show at Governor&apos;s Island is a BNR Presents show, featuring L-Vis 1990, Le1f, Pilo, and Samo Sound Boy alongside Baauer, Boys Noize, and Spank Rock.